Charles P. Rogers New Location! We have opened a new factory showroom at 213 East 59 Street, between 2-3 Avenues, in Manhattan. If you are in the neighborhood please stop by, say hi, and test drive one of our fantastic mattresses! It’s that time of year again when we’re dreaming of sand between our toes and the sounds of the sea. I think most everyone I know fantasizes about spending summers on the beach. I know I do. These five unique beach house bedrooms would make for perfect days and nights along the coast. This Charleston bedroom is decked out in traditional blue and white beach colors but with a hint of beige. A comfy club chair, desk, and a stunning view turn this room into a haven for sleeping, reading, working, and relaxing. A San Francisco beach house sports a mostly green bedroom but with blue walls. Bright white furniture and trim keep the room feeling fresh and clean. A starburst mirror adds an eclectic element to the space. 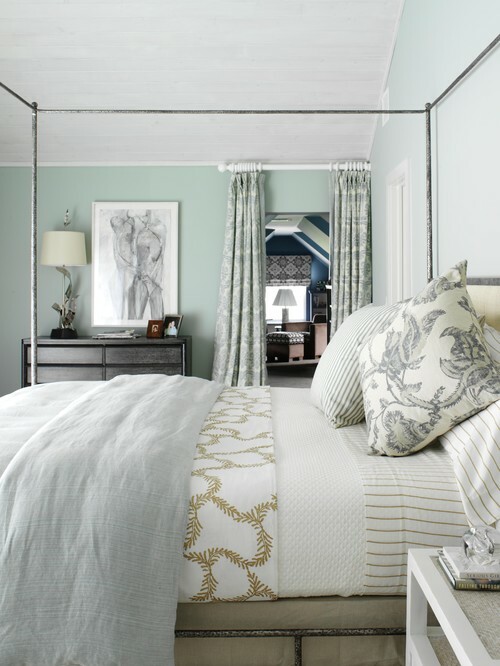 Designer Barclay Butera decorated this Ocean County bedroom. 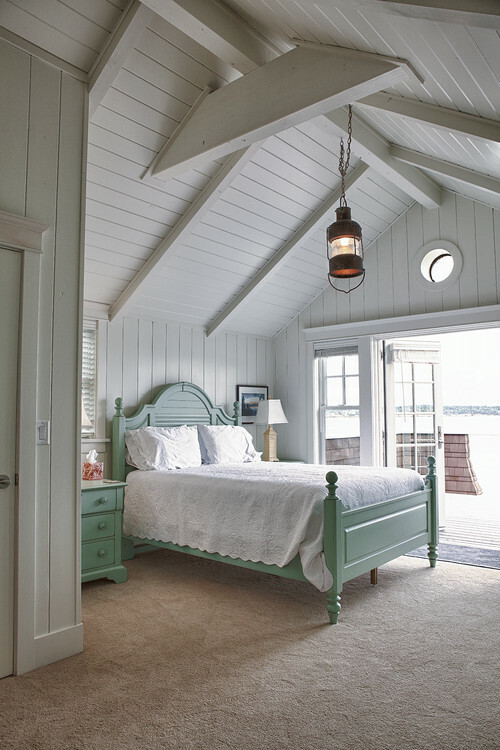 White bedding with an awning stripe at the food of the bed plus a ship above the bed create a nautical theme, ideal for a home along the California coast. 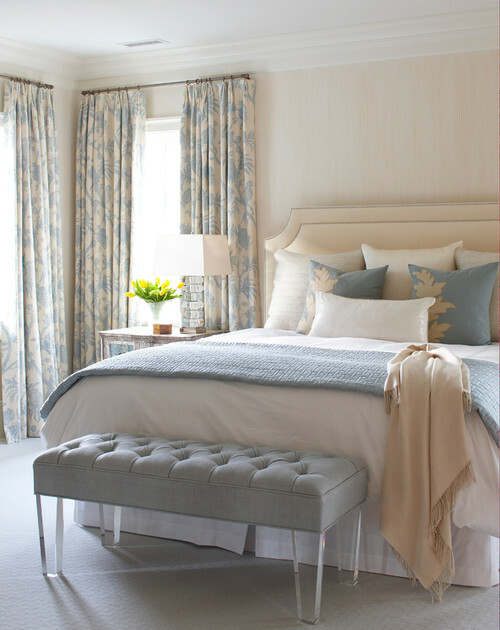 This gorgeous master bedroom designed by Tara Seawright doesn’t skip a beat. Located in Shelter Island, New York, the space feels undeniably coastal yet comfy. The pitched board and batten ceiling of this Seattle beach cottage takes center stage. The decor is no fuss, but subtle touches like the rustic pendant, porthole window, and French doors add interest to the otherwise simple design. Basements used to be considered less-than-desirable spaces, but more recently, these subterranean rooms are often used for family rooms, play rooms, offices, and even bedrooms. Depending on the structure, basement bedrooms can be attractive, stylish, and comfortable, offering everything that a ground floor or second story bedroom would. Still not sold on sleeping in the basement of your home? 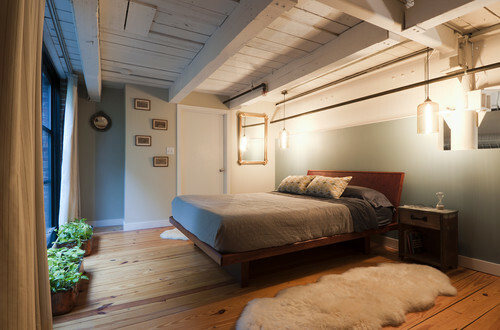 Look at these basement bedrooms for inspiration. This basement bedroom designed by Knudsen Interiors allows light to seep in through clerestory windows, which add a visual element at the same time. With its earthy color scheme and modern touches, this room takes on an Arts and Crafts feel. Believe it or not, this bedroom is in a basement and the space sports 9-foot ceilings (that height is practically unheard of in basements). 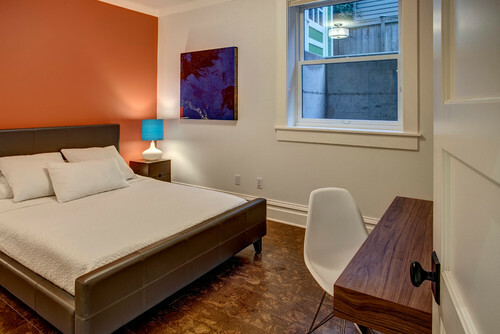 A bright orange splashes the bed wall and warms up the space. Cork flooring is appropriate for a room below grade. I don’t know that I’ve ever seen such a beautifully decorated basement. A modern Knoxville bedroom pulls out all the stops with an ample sleeping space and a separate seating area. Exposed beams give the room a rustic feel, yet the furnishings are contemporary. Bringing light into any bedroom is essential, but it’s especially difficult in basement bedrooms. This light well patio eliminates the basement feel and creates a private outdoor space. It’s a win-win. What’s not to love about this bachelor basement bedroom? Exposed floor joists introduce pattern and increase ceiling height. Gray walls, pine floors, and minimal furnishings lend an industrial feel.